when we moved into our rental house the neighbourhood seemed boring. everywhere worth going was at least a half hour walk away...or so i thought until we discovered the nearby thrift store. since that then, every few days we take a trip to see what treasures can be found and the house is slowly filling up (literally) with vintage and second-hand goodies. i don't think i buy anything new anymore and i for sure never pay full price if it is new. some people call it cheap, i call it an adventure. the pieces you end up with have so much more character and are completely unique. 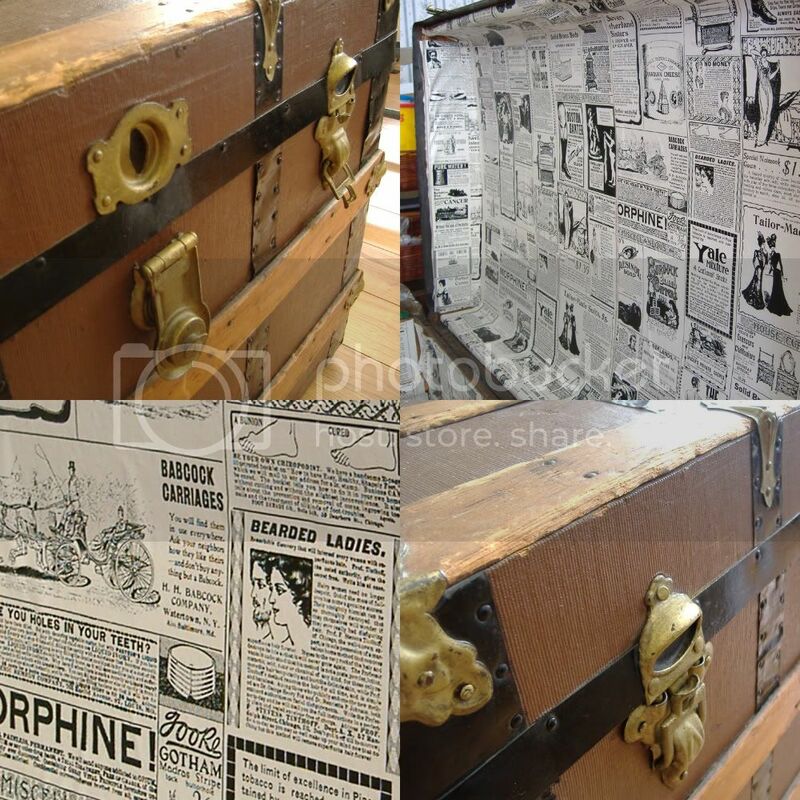 on to my most recent find, the other day we were shopping at our thrift store and i found a wonderful old steamer trunk. 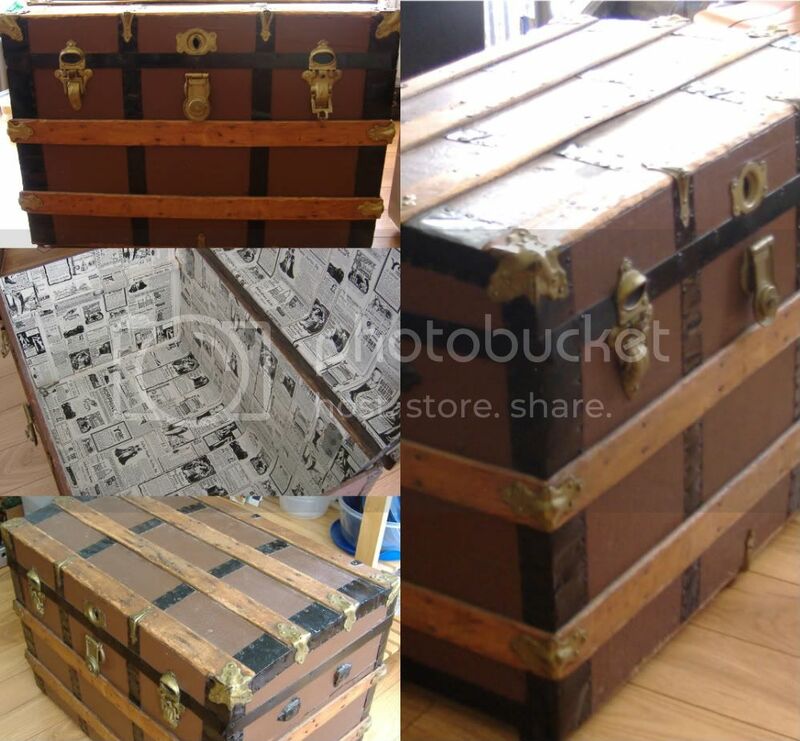 i've spotted trunks a few times at second hand stores, but they're usually in rough shape and pretty stinky inside. then i spotted this baby. it has a few bumps and scratches but the hardware still looks great, even the casters on the bottom work perfectly. the leather handles are long gone, but once i figure out how, i'll try to replace them myself. the inside is papered in an old style news print, with some funny old-time ads selling things like morphine and bearded ladies. after doing a little research on trunks and restoration, i learned that the outside of my trunk is likely covered in coated canvas which could be removed to expose wood (probably pine). for now i'm just going to clean it and leave it as is, i'll save the bigger restoration project for sometime in the future. even though the trunk didn't appear to have any mildew or mold inside, i used mild soap and a little bleach in warm water to clean the inside and left it open to dry for a few hours. i vacuumed the outside with a brush attachment to get all the dust and spider webs off and i read that the canvas and wood can be cleaned with murphy's oil soap and a soft cloth, so i'll have to pick up some of that next time i'm out. there are many uses for these types of trunks. they are great for storing blankets or sheets and out of season clothes. it could also be used as a coffee table or a bedside or end table with a tray on top to protect it from accidental spills. after shooing the cats our i'm going to use the trunk for fabric storage, which will help control the growing piles of random fabrics and sewing projects that find their way around the house. i love the look of old luggage and trunks, in fact i use a vintage suitcase to store my knitting supplies, so i'll definitely be keeping my eye out for more styles of trunks and suit cases to add to my little collection. come back soon because i'll be posting more thrift store finds in the future and i'd love to hear about your found treasures too!